What lessons can be learned from the implementation of the Effort Sharing Decision (ESD) to date? The Effort Sharing Decision (ESD) was agreed by the EU as part of the Climate and Energy package in December 2008. 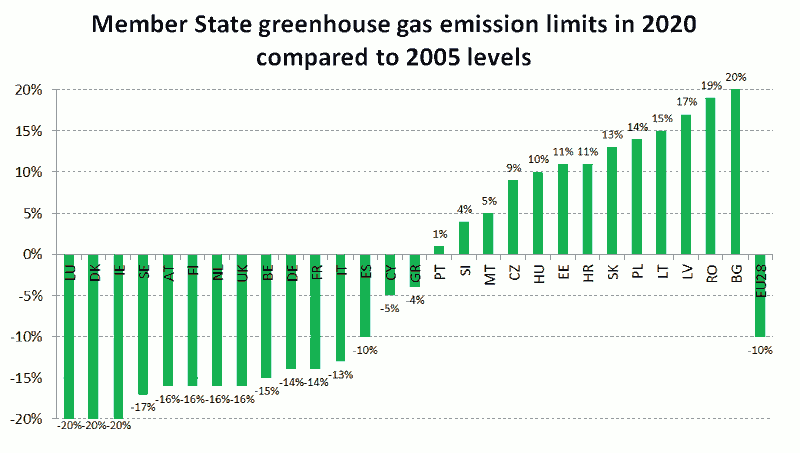 It sets national limits for greenhouse gas (GHG) emissions in the non-trading sectors in the EU Member States in 2020. This target also forms part of the Europe 2020 Strategy, which is aimed at overcoming the effects of the economic crisis as well as at addressing the shortcomings of the EU’s growth model and creating the conditions for a different type of growth that is smarter, more sustainable and more inclusive. The Decision defines linear legally binding emissions trajectories in Member States for the period 2013-2020 with annual monitoring and compliance checks. It also provides flexibility for Member States in reaching their targets by allowing transfers of annual emissions allocations between years, between Member States and the use of external credits through the Clean Development Mechanism. In this way the ESD can be regarded as (flexible) emissions ceiling, which can be achieved via multiple sectors, comprising both national and Community wide instruments. Trinomics, in collaboration with Ricardo-AEA (lead partner), IEEP and VITO, evaluated and provided support for assessing the impact of the Effort Sharing Decision (No 406/2009/EC). In particular, the objectives of the study were to 1) evaluate the implementation of the Effort Sharing Decision, the experience and lessons learnt, and 2) assess economic, social and environmental impacts as well as the administrative burden of different policy options for a number of specific aspects of the ESD. The ESD was found to be partially effective to date: it was possible to identify that the ESD has been effective in stimulating new national policies, in at least some Member States, but there was insufficient evidence to quantify the overall impact of the ESD on GHG emissions. The ESD delivered the outcomes efficiently, although there may still be some opportunities for reducing administrative burdens. There is a strong coherence of the ESD with other EU Climate and Energy policies. The objectives of the ESD remain relevant, and still correspond strongly with the needs of the EU. The ESD was found to add value through EU action; it is unlikely that in the absence of the ESD the same level of actions to control GHG emissions in ESD sectors would have been taken. Stakeholders acknowledge the usefulness of regular reporting requirements under the ESD. This is useful for Member States, the EU and the public. Existing studies do not allow the effects of the ESD on GHG emissions to be quantified with sufficient certainty. This requires further analysis to more clearly identify the influence of specific policies and measures. The data reported by MSs under the Monitoring Mechanism Regulation (MMR), has limitations when used to assess the impacts of EU-wide policies. We recommend that this should be improved. There may be opportunities for energy and climate reporting to be further streamlined, reducing the administrative burden. We recommend to further review the potential areas where opportunities for streamlining may exist. It is too early to evaluate the effectiveness of some ESD elements, such as the flexibility options. We recommend that these are evaluated in another evaluation study to be performed in 3 or 4 years time.